Passing the ball is so critical to the game of soccer. The ability to control the ball an move it to a teammate is fundamental to the game. Here is a versatile drill that can be used as a competitive passing drill. Three to four sets of the triangles are set up as shown in the first diagram. Three players are in each triangle and set up on the cone in each location. Distance between cones should be about five yards within the triangle and 15 yards between triangle sets. 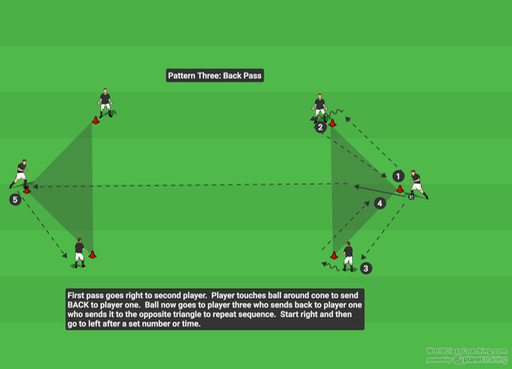 Players execute a series of predetermined passing sequences as shown in each diagram. 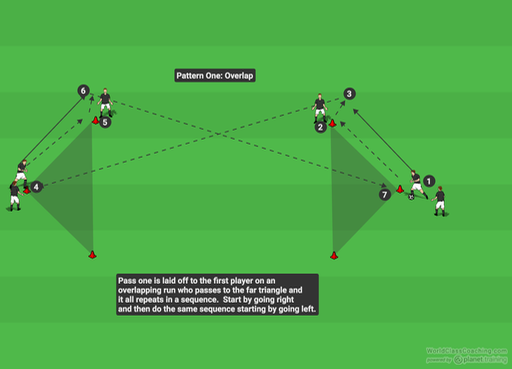 Players should eventually become so adept at this warm up that it can be led by the players with the switching of the patterns being done by the leaders of your group. Spend approximately three minutes on each passing sequence before switching sides. 1. 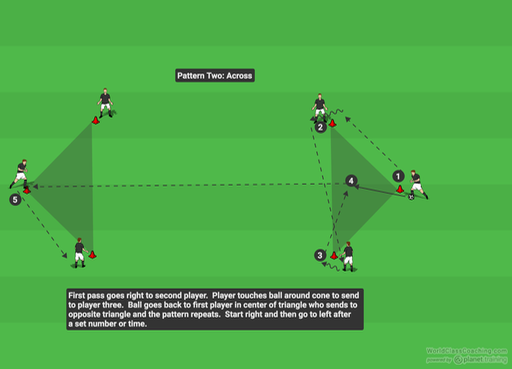 Coach can set up competitions between the groups to see how many passes in a pattern can be accomplished in a set amount of time. 2. Coach can change up the size of the triangles in increasingly bigger distances and switch groups to each of the increasingly bigger spaces. The precision of passing touches can be translated to the larger spaces that may occur in the game. World Class Coaching offers a wide variety of tools. They have a wide variety of instructional resources that can help coaches of all levels. I have included a link to one of those resources and best of all it is FREE. Click the link 50 Soccer Coaching Drills get a copy of this free eBook.